Thanks to all the entrants! The winning photo shows a young Zander Nichols learning about grinding blade angles with Travis Wuertz of Wuertz Machine Works. It shows the spirit of knifemaking in action and the generosity of the knife community. 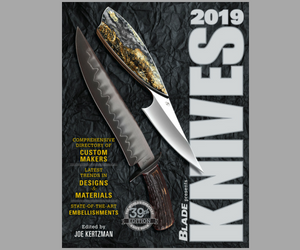 Nichols will receive a one-year subscription to BLADE magazine on the house. As it turns out, Nichols is already making eye-catching knives. You can see them on his website here.